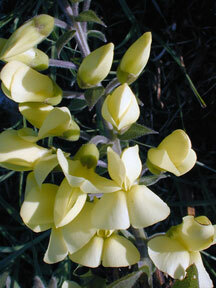 Also Called: Long-bracted wild indigo. Stems: Erect or ascending, much-branched above, silky-hairy. Leaves: Alternate, nearly sessile, usually 3-foliolate; leaflets lanceolate, spatulate, or elliptic, 1 to 4 inches long, 1/4 to 1 inch wide; margins entire; tips rounded or pointed; stipules ovate to lanceolate, .75 to 1.5 inches long, about 1/3 size of leaflets; tips tapering to points. Inflorescences: Racemes, showy, many-flowered, 4 to 8 inches long, terminal, bending downward. Flowers: Bracts oblong or lanceolate, .5 to 1.25 inch long; calyces 2-lipped, upper lip entire to 2-lobed, lower lip 3-lobed, stiff-hairy; corollas papilionaceous, about 1 inch long, cream or pale yellow; banner not longer than wings; stamens 10, separate. Fruits: Pods, oval, 1 to 2 inches long, beaked, pubescent; seeds about 1/6 inch long, brown to olive. Habitat: Sandy or rocky prairies, pastures and roadsides. Toxicity: The foliage of young plants can be poisonous to livestock if consumed in large quantities. Uses: The Pawnee treated colic by rubbing a mixture of pulverized wild indigo seeds and bison fat on the abdomen. Comments: The roots of plains wild indigo can grow to 6 feet long.